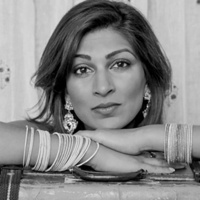 Acclaimed actress Minita Gandhi makes herself the main character in her self-penned, one-woman performance of her struggle to find identity as a woman born in India and raised in the United States. It is a discovery filled with laughter and tears as the road to self-identity takes many turns. Gandhi can be seen in the recurring role of Dr. Prospere on NBC's Chicago Fire, as Musarrat in the web series Brown Girls, was The Onion News Network's anchor, Nina Shankar, and has appeared in many television shows. She is a Master Instructor for Pinnacle Performance Company, where she developed a Women's Leadership Program, and the co-creator of the Women and Femme in the Arts Mentorship Program. MUTHALAND is her first full-length play.